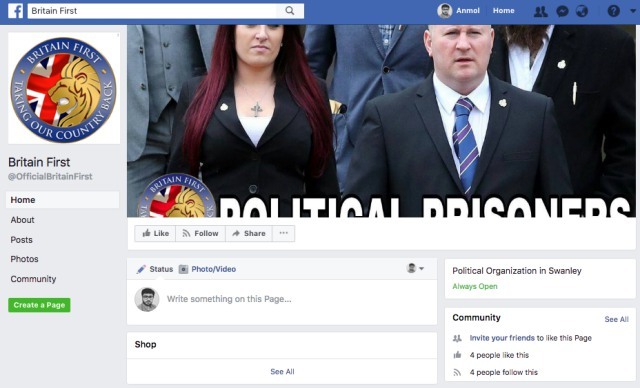 In a move that’s sure to attract a lot of attention in political circles around the world, Facebook has today banned far-right group Britain First from its platform for violating its community standards and posting rules. The social network stated that the group ‘repeatedly posted content designed to incite animosity and hatred against minority groups,’ which is not acceptable as per its guidelines. According to the official blog post, the official Facebook pages of Britain First, as well as its leader Paul Golding, and deputy leader, Jayda Fransen have been taken down as part of this cleanup exercise. Their personal profile of these leaders have, however, not been touched. Britain First is a controversial alt-right extremist group which boasts of more than 2 million followers and drew a lot of attention in the run up to the last elections in the country. It’s followers are primarily fringe white supremacists in the country. While it claims that it is working to preserve British culture, the group’s primary focus seems to be eliminating muslims and immigrants from the country. We are an open platform for all ideas and political speech goes to the heart of free expression. But, there are times though when legitimate political speech crosses the line and becomes hate speech designed to stir up hatred against groups in our society. While Facebook has not implicitly pointed out the posts that could have led to the ban but it mentions that its community standards that clearly state this sort of speech is not acceptable on Facebook. It further adds that the social media giant has been made aware of multiple hate-filled and violence-inciting instances and has worked to remove any such content from the platform.